I love the effortlessness of the maxi dress. You can throw it on, put the hair up in a bun and BAM POW!..instant glamour. Max out the lazy days of summer with one of these beauties! TALL MAXI DRESSES. From left to right: Tall Women's Halter Tea-Length Dress ($29.50 at Oldnavy.com), Tall Jersey Maxi Dress ($69.95 at Gap.com), New Maxi Dress (84.50 at Longlegs.ca), LEL Maxi Dress ($89 at Tallwomensclothes.com) and Embellished Shoulder Maxi ($135 at Longtallsally.com). Don't see a maxi you like? Click the pic to visit the TallSWAG dress page to find one that is perfect for you. WOMEN'S HALTER TEA-LENGTH DRESS at Oldnavy.com. $29.50. Sizes tall S to XXL. Shown in agave nectar. Also comes in atomic purple, grey and jurassic green. 50" from top to bottom. 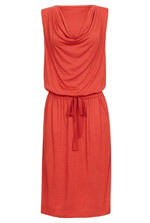 TALL JERSEY MAXI DRESS at Gap.com. On sale for $55.96. Sizes S to XL. Shown in jade stone. Also comes in true black knit. NEW MAXI DRESS at Longlegs.ca. $84.50. Sizes S to XXL. Shown in melon. Also comes in black and fushia. 64" from shoulder to hem. The maxi is 4th down on the page. 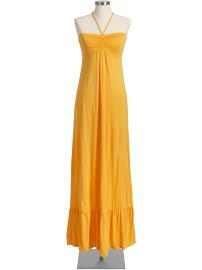 LEL MAXI DRESS at Tallwomensclothes.com. $89. Sizes small to extra large. Shown in wine. Also comes in black and teal. 58" from shoulder to hem. EMBELLISHED SHOULDER MAXI at Longtallsally.com. On sale for $89. Sizes extra small to extra large. 53" from shoulder to hem. Summer is a time to relax and be carefree. The Covet Dress from Long Legs will let you do both. This beautiful light blue dress is soft, flowing and fashionable. Pair with flat sandals for a kick back look that will still get you looks. Get your dress now. Click the pic. TALL BLUE COVET DRESS at Longlegs.ca. $98. Sizes small and large. Dress is 4th one down on the page. BERNARDO MATRIX SANDAL at Barefoottess.com. $109. Sizes 12 and 13. Shown in natural. Also comes in black.